The Noble fir Christmas tree is one of our more popular varieties. Noble fir (Abies procera Rehd.) is symmetrical and has a deep bluish-green color. The long needles are four-sided and twist upward leaving the lower surface of the branch exposed. 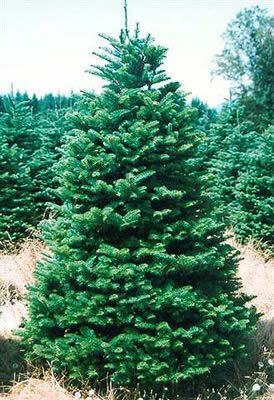 The noble fir is dense and grows slower than most other varieties. The noble fir Christmas tree is a durable tree featuring dense foliage and a sturdy conformation. The aromatic dense foliage blends ornaments within branches. Available from two feet (table top) to twelve feet high. For larger trees, see Big Trees. Long considered an excellent Christmas tree because of its beauty, stiff branches and long needle retention, the noble fir is growing in popularity. It is widely used in the greenery business to make wreaths, door swags, garland and other Christmas products.